Eat flax cereal for weight loss can be almost everything. It has no contraindications, and has a pleasant taste, especially if you add flax flour to the fennel and a little dill. Here are just lose weight with "flax diet" one. The thing in common errors in the use of a useful product. Linseed meal, hot but not boiling water, a little fennel, fresh dill and sea salt, or prepared flax cereal for weight loss from the pharmacy. Get rid of illusions. To lose weight in linseed diet, as well as any other, only if you manage to create a moderate energy deficit. Calculate your requirement of calories, proteins, fats and carbohydrates in any online calculator, and subtract from this figure of 10-20%. That's how much you need to eat to lose weight without harm for health. Enter flax cereal for weight loss diet. Select the meal that you usually do not drink hot water. 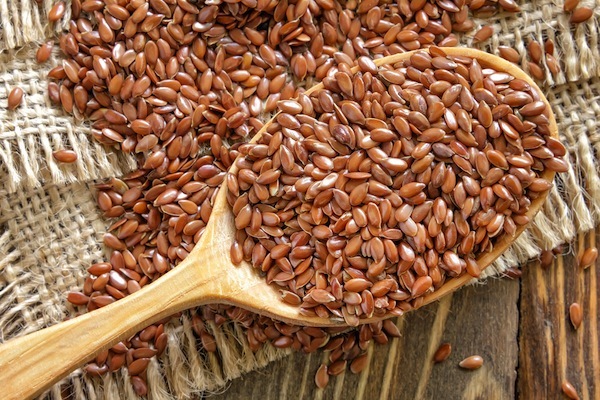 The benefits of Flaxseed cereal, the high fat content of omega-three and fiber. Unsaturated fatty acids "do not like" neighborhood with boiling water, so the "scatter" reception porridge and hot drink at least half an hour. A standard serving of flax cereal - 3 tablespoons of flour plus additives. It is about 150 kcal, hence "from one cereal" you can make either a light Breakfast or afternoon snacks. Prepare flax cereal for weight loss. Boil water, cool it for about 5-6 minutes, pour the 3 tablespoons of flour with water, cover with a lid and wait 15 minutes. Then mix up the resulting mush, add the greens and fennel, and welcome to the table. Flax cereal is good for the heart and digestion, and can speed up the metabolism. But the main rule of weight loss is creating an energy deficit, not the use of "Superfoods". Remember that adding flax flour sugar, cream and candied berries, you increase the caloric value of the dish. Reviews about Flaxseed porridge for weight loss, published online show that it helps to carry calorie restriction, reduces appetite and improves digestion and has a beneficial effect on the skin. Flax porridge reduces the appetite due to the high content of dietary fiber. If you are feeling especially hungry by dinner and overeat is usually in the middle of the day, it makes sense to have Breakfast porridge. For those who like a 3-4 dinner, instead of the first evening meal to eat a portion of porridge and a bit of protein, for example, a couple of tablespoons of nonfat cottage cheese. This will help to curb the evening appetite and to keep within the "corridor calorie". Many people wanting to get rid of a few extra pounds, looking for effective ways to do this without damage to health. Dietitians by reviewing many different diet ways of eating, it is recommended to pay attention to flax seed, which allows to solve this task. The main reason for accumulation of fat lies in the failure of the excretory function of the body. The following causes of accumulation of excess weight are hormonal failure and diabetes. In all these cases the flax seeds for weight loss in the form of decoctions, contribute to the normalization of blood sugar levels, the release of the body from the accumulated harmful substances and excess fluid. The seeds can be used in a very powdered form. The thus obtained Flaxseed meal to add to porridge, soups, dough, meat and other food. Ground seeds are better absorbed in the digestive system, but it is necessary to grind them just before use. The seed tends to swell once in the stomach, creating the effect of fullness. This allows you to eliminate the habit of overeating. While the seeds should swell in the stomach, so they should be consumed in powdered form, and drink plenty of fluids. To improve taste you can add honey or jam in a ratio of 1:1. In order to avoid poisoning is not recommended to exceed the daily dose of the seeds, which is four tablespoons (50 g). Besides, after two weeks of taking this product, it is recommended to do a week break. And after three months of use to rest 30 days. Whatever the widespread use of this useful product, yet the people are mostly familiar weight loss with flax seeds rather than its other use. Through its contained acids, activates cells, is the fat burning and retain a normal weight. There are many different recipes for funds. You can even just chew flax seeds to eat, so there will be an acceleration of metabolism, and can be consumed flax seeds with yogurt for weight loss. The essence of this method (duration 3 weeks): afternoon snacks should be replaced with 1 tsp. of crushed seeds mixed with a Cup of yogurt (200 ml). This scheme is valid for a week. With the onset of each new week you need to increase the number of seeds in one spoonful. Yogurt can be replaced with a natural yogurt without flavorings. From seed you can prepare a decoction. For this you need 1 tbsp of the product pour boiling water (200 ml) and cook on very low heat about 30 min. Seeds need to be stirred. After cooking, the broth needs to cool down. To use it you need before eating (100-150 ml). The easiest way to make an infusion of flax seeds – pour 1 tbsp of the product is 0.5 liters of boiling water and give in for the night to infuse the mixture in a thermos. 100 ml of infusion should be taken before eating. Thanks to the use of this method of diet will strengthen the body, but we should not expect too fast of weight loss. In addition, that rapid weight loss is stressful to the body, it will undermine the health of all its systems. It is better to lose weight slowly but profitably. Besides consuming seeds for weight loss can feel not only a gradual weight loss but also beneficial effects on the body.